From Tuesday, May 30th at 12:00 AM ET to Friday, June 2nd at 11:59 PM ET. 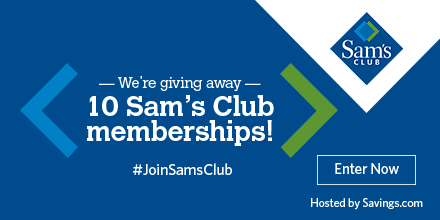 Ten (10) winners will receive a gift card for a one year Sam's Plus membership to Sam's Club worth $100. Users enter the giveaway by heading to the Sam's Club merchant page on Savings.com and submitting their email address on the form on the page. The winners will be chosen through a lottery drawing and notified on Monday (6/5) via the email address they used to enter.